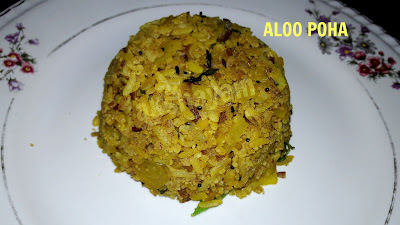 Aloo Poha, quite arguably one of the more popular Indian breakfast, or snack dish for that matter, is a humble preparation that's immensely satisfying. There are innumerable varieties to be found, and the flavour and ingredients vary from even household to household!! I add here a pretty basic recipe which can be developed in any way one prefers. Sticking to my mantra of less white and more brown, I used Brown Poha or flattened rice for this recipe. Both the thick and semi-thick ones can be used. The paper thin variety might not yield that great a result. If the brown version is not available, use the white one. 1. Wash the poha to remove impurities and soak in about half the quantity of water for 10 minutes or just before beginning the preparation. If using the thicker poha, soak it for longer. Typically the poha would have soaked up all the water, else drain excess water and let it rest in a colander/sieve. Take care not to soak to the extent that the poha or flattened rice becomes squishy. 2. Heat oil in a pan or wok. Add the mustard seeds and let splutter, followed by cumin seeds. 4. Add the soaked poha and mix so the potato mixture coats it well. Check for salt and let cook for about 5-7 minutes more. Turn off the flame and finally add the lemon juice. Mix again. Garnish with chopped fresh coriander leaves and let rest for about 5 minutes more to allow the added flavours to get soaked in.